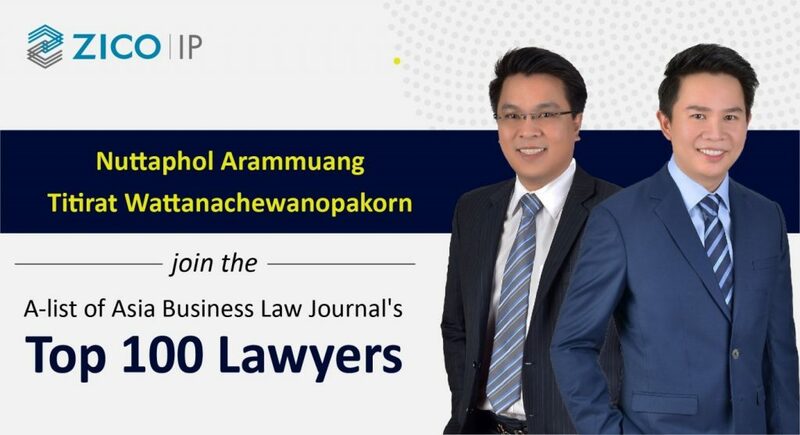 We are proud to announce that ZICO IP Partners Nuttaphol Arammuang and Titirat Wattanachewanopakorn and have joined the A-list of Asia’s Business Law Journal’s Top 100 lawyers. The A-list is a ranking of Thailand’s best private practice lawyers, based on extensive research and nominations received from in-house counsel in Thailand and abroad. Nuttaphol and Titirat are both Partners at ZICO IP, which provides a full spectrum of legal and consultancy services in the protection, commercial exploitation, enforcement, and litigation of all types of IP rights. Nuttaphol was noted for having ‘exceptional knowledge’ and providing ‘timely delivery’ according to client feedback. He is an accomplished IP litigator, with over 15 years of experience in an array of contentious and non-contentious IP matters arising in Thailand and overseas. He has garnered many accolades, including being ranked as a ‘Recommended Lawyer’ by Legal 500 in 2017, and a ‘Leading Trademark Expert’ by the World Trademark Review 100 in 2018. Titirat has over 13 years of experience in intellectual property practice at both the domestic and international levels. Specializing in anti-piracy & anti-counterfeiting, Titirat has a practical and commercial approach towards solving clients’ needs and has assisted numerous clients in developing and implementing effective strategies with regards to IP protection of their global brands. “Titirat has become a trusted advisor to me and my US clients for trademark law matters in Thailand. He and his firm are extremely positive and helpful. Moreover, Titirat is one of the nicest professionals with whom I’ve dealt with. He is highly recommended.” – Matthew Homyk, Attorney, Blank Rome.